Hi, I am building a crane to raise and support the front end of a motorcycle. My idea is to make it very much like and engine crane, except the arm will be stable and us a pin that will attach to the bottom of the triple tree. I am planning on using square tubular steel and my question is what diameter and thickness square tube should I use? I am guessing the weight to be less than 500 lbs. I was thinking 3x3x1/4 or 3x3x1/8? Is there a formula for figuring this out. Without seeing specific designs its impossible to size material, but likely for motorcycles a tube 1/8x2x2 or better would be sufficient if this is designed anything like an engine crane, but again, only a guess as to what is going on, length is one of the most important factors. You might download BeamBoy and see if you can calculate what you need. Or check out the dimensions on a lightweight shop crane if your arm design is similar. My $99 engine crane is made from 2.5x2.5x1/8" mild steel tubing. The boom is about 4 feet long when fully extended. As I recall it is only rated for 1/2 ton when fully extended. 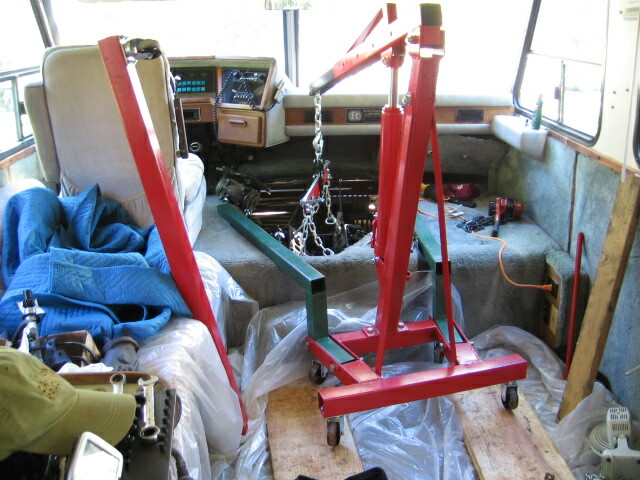 It successfully lifted the Chevy 454 ( a bit over 600 pounds) out of my motor home without any noticeable deflection. Being that it was made in China, I was more worried about the welds than the steel. It has also raised both my Buell Blast (350 pounds) and my sons Kawasaki (400#) completely off the ground for tire changes etc, like they were not there. The green leg mods to clear the engine hump are my handiwork, also welded from 2.5x2.5x1/8" mild steel. I would probably say that 2x2x1/8" would be strong enough for what you want, but I'd still go with the larger while steel is cheap again. Last edited by smyrna5; 09-17-2009, 07:49 PM.